Relief & Support in 3 Therapeutic Blends. The Therapeutic Trio is a natural everyday remedy bundle with 3 effective blends designed to support your overall wellness. 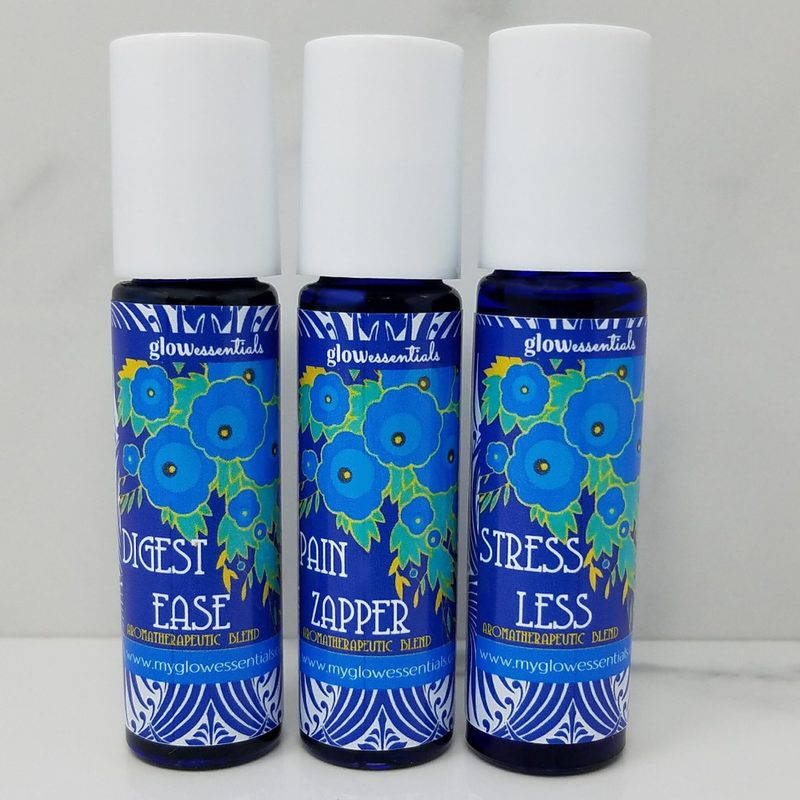 Including DigestEase, Less Stress and our new high potency Pain Zapper Therapeutic Blends, these effective remedies are portable and convenient. 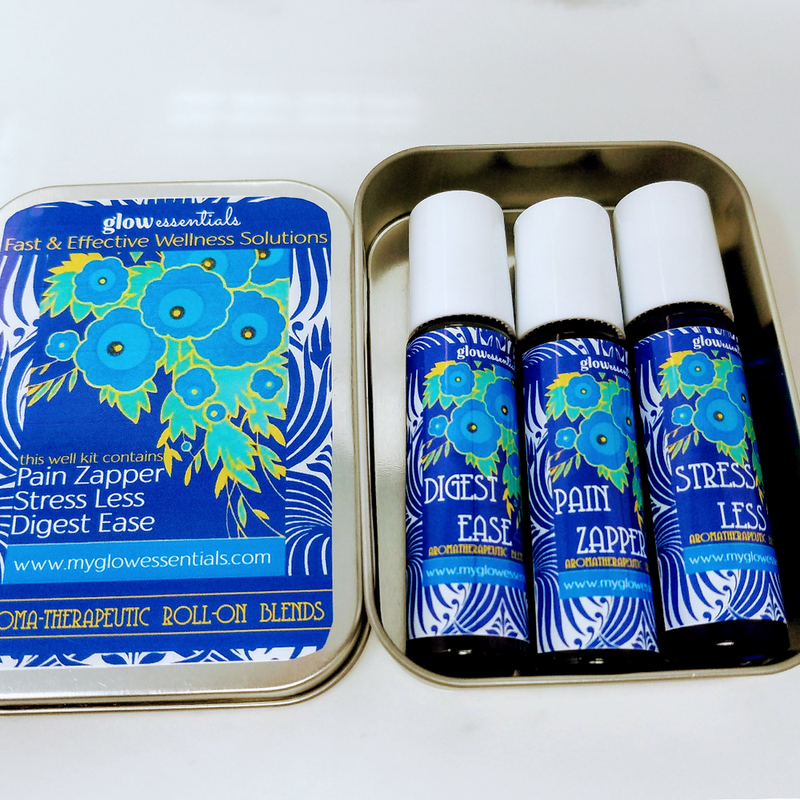 The therapeutic trio includes 3 of Glow Essential's aroma-therapeutic remedies designed for use on the go. Easy to use and amazingly effective, these blends get to work on contact to provide relief and support. DigestEase Therapeutic Blend helps to ease digestive discomfort. Available in a convenient and portable roll-on applicator, DigestEase contains a synergistic blend of pure, therapeutic grade essential oils which work to help relieve digestive pain, bloating, cramping, gas, indigestion, nausea and other digestive complaints. It is also effective for stimulating the digestive process. These botanical oils contain properties which have been shown to act on the digestive system and provide relief, and are commonly used in many cultures to treat common digestive issues. Please seek medical attention if you experience digestive symptoms that are severe in nature. Less Stress Therapeutic Blend is a soothing & uplifting blend designed to help you to relax and allow the tension & anxiety to melt away. The pure, premium essential oils in this blend are calming and uplifting, creating a relaxation response throughout your body. Available in a convenient and portable roll-on applicator, these oils are known to be analgesic (pain relieving), calming, soothing, restorative, anti-inflammatory, regenerative, and have anti-depressant qualities. Please seek medical attention if you experience stress symptoms that are concerning. Pain Zapper with HEMP oil Therapeutic Blend is made with a highly effective synergistic blend of pain relieving & inflammation reducing oils, including full spectrum, organic HEMP oil and other powerful essential oils. This blend is commonly used for sore muscles, achy feet and swollen, painful joints. When applied topically, results can be felt immediately. This blend works incredibly well! It’s a customer favorite. This item is not intended to replace professional medical advice. Please seek medical attention if you experience symptoms that are concerning. Lavender is a flowering plant that is known around the world for its many therapeutic applications. From easing anxiety, to reducing depression, it is great for skin conditions, especially those caused by stress. It is very calming to the nervous system due to it's unique chemical properties. Scientific evidence suggests that aromatherapy with lavender may slow the activity of the nervous system, improve sleep quality, promote relaxation, and lift the mood. Aromatherapists use lavender in inhalation therapy to treat headaches, nervous disorders, and exhaustion, among other things, and herbalists commonly use lavender to treat skin ailments. Because Lavender has some pain reducing properties, studies have also shown it to improve pain control after surgery. At Glow Essentials, we use Wild-crafted French Lavender that is grown at a high elevation in the south of France, the "true" French Lavender for it's superior therapeutic applications. 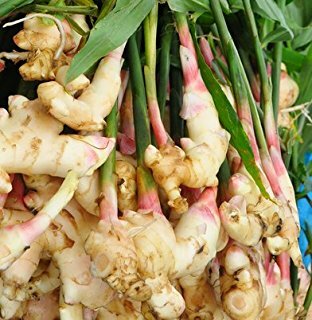 Ginger root (well, it's actually a rhizome) is known widely to be an effective remedy for nausea. In China and India, ginger has been considered a highly medicinal plant for nearly 5000 years. Having nearly 115 chemical constituents, studies on ginger have confirmed it's analgesic, antispasmodic, carminative and stomachic properties, which basically just means that it is great for easing digestive discomfort. In fact many modern day studies have confirmed the scientific reasoning behind longstanding traditional use. Ginger is commonly used by herbalists in strong infusions to ease discomfort from gastrointestinal spasm, digestive problems, flatulence, diverticulosis, irritable bowel syndrome, constipation, nausea and sea sickness. In fact, one scientific study confirmed it was more effective than Dramamine in relieving seasickness. This aromatic herb is a great ally for relief from digestive complaints. Turmeric is a rhizome in the ginger family. It is a highly prized botanical used in Ayurvedic and Traditional Chinese Medicine for it's many health benefits. Therapeutically it is analgesic, anti-inflammatory and antispasmodic (relieving pain, inflammation and muscle spasms) and is frequently used to ease general aches and pains, especially those associated with arthritic conditions. We use a concentrated organic CO2 extracted Turmeric oil from India. Less StressTherapeutic Blend can be applied to the pulse points and worn as a perfume (it smells amazing!) or the aroma can be inhaled directly from the bottle. This product is not intended for internal consumption. DigestEast Therapeutic Blend can be applied to the abdominal area or the aroma can be inhaled directly from the bottle. This product is not intended for internal use. Please seek medical attention for serious symptoms. Pain Zapper Therapeutic Blend can be applied to painful joints, tense muscles or achy feet to alleviate discomfort on contact. Do not apply to open wounds. This product is not intended for internal consumption. Seek medical attention if symptoms persist or are concerning. This product is not intended to substitute professional medical advice.